Monday, Houston experienced a cluster of storm cells which dumped anywhere from four to six inches of rain in a little less than three hours. Southeast Texas and the whole of Texas have experienced a drought of historic proportions for more than thirteen months, the rain was greatly needed, however, with the ground so hard, the water did not really have anywhere to go. 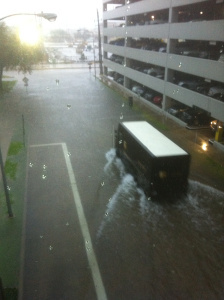 The result in Houston, wide-spread street flooding. Several major highways and side streets became impassable and a number of cars and drivers were flooded out by the rapidly rising water. Other cars were stalled out as their drivers ignored the potential dangers posed by standing water. A really good tip to remember when it comes to driving in standing water, if you cannot see the curb, you probably should not go forward. Typical curbs in cities are a minimum of 4 ” tall (rounded) and 6″ is for vertical curbs. If you cannot see the curb, there is a great chance of 6 plus inches of standing water and it does not take a lot of water to hydroplane, lose control of your vehicle or get water inside of your car. Cars are generally well protected when it comes to water, but they were not designed to be flooded or submerged or run in water. Further, today’s cars are largely dependent on their powertrain control module, the onboard computer of the vehicle. The electrical damage which can occur from water in your car effectively can have several different effects, which most people do not think about. For one, water can prevent the distributor from doing its job and if your vehicle stalls, you will not be able to generate sufficient spark to start the car. Two, the cars ABS and traction control systems, the two systems most responsible to prevent hydroplane, might not work due to electrical damage. The third concern with respect to water and your electrical system, one that most do not think about, is your power windows. Why is this important? If your car enters a large amount of standing or moving water, it effectively loses traction and you have lost control, it is a very dangerous situation. Over 300 people a year lose their lives in incidents involving water immersion. The main problem, they cannot get out of their vehicle. In the event your car becomes involved in a water event, like some did this past Monday, there are four tips to remember: 1) Open the window, 2) Take off your seat beat, 3) Exit the vehicle and 4) Swim as quickly as possible to safety. Why is open the window number one? If the car is in water and has or is about to experience an electrical short, there is very little time to open the windows, once there is a short, the power windows will not work. Opening the window requires breaking one. This is where the danger lies. Auto glass is tempered, designed not to break or shatter, for safety reasons. In a submerged or immersed vehicle, the pressure on the doors might prevent the opening of a door, the window is generally the best option, but you have to be prepared. There are many tools which can be kept inside the vehicle which allow for a driver to break a window if necessary, but one particularly good tool is the LifeHammer. The LifeHammer not only allows you to punch out a window with ease, it also includes a tool to cut a seatbelt in the event you need to get out of the seatbelt in a hurry or it malfunction. For less than $20, if you live anywhere it floods or close to rivers, lakes or coastal waterways, this is a necessity. At the end of the day, driving in any type of standing or moving water should be avoided. The dangers posed by hydroplane and vehicle immersion are real and very dangerous. Besides the tremendous financial damage water can cause to a vehicle, it is also can be a life taker. Know what to do in the event you are involved in a vehicle immersion situation and have a tool available to get you out. However, the best advice possible, if it is raining hard or there is street and low-lying area flooding or rapidly rising water, do not drive through, turn around, seek higher ground. DefensiveDriving.com has a great video on hydroplane and it is a focus of our online driver safety program.